When recently Fujifilm announced the new XF lens roadmap, I was very happy to see that Fujifilm took 1:1 our lens suggestions we made 1.5 years ago, and that they decided to give us what you guys voted your most wanted prime (33/1) and your most wanted zoom (16-80/4). So we all should be happy about it, right? … but now that we convinced Fujifilm to make the 33/1 and 16-80/4, we also better buy these lenses, or we might get in trouble. I mean, if the FR-community directed Fujifilm’s R&D into projects that turn out to be a failure, then will they ever listen to us again in future? Now, I have little doubts that the XF16-80mmF4 will be a huge seller. As we have shown in our size comparisons based on technical Fujifilm sketches (thanks again Yoav) and you can also see from the first 16-80 real life images, it is smaller than the XF18-135, which can be seen as a direct “travel lens competitor“. I guess many of us will be tempted to put the XF16-80mmF4 in our travel bag. 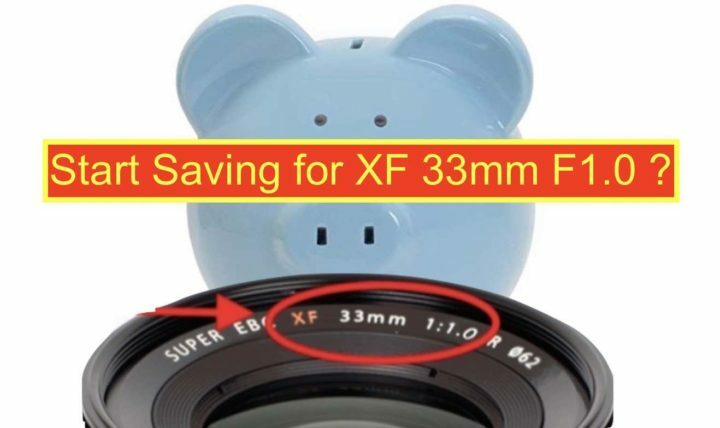 But what about the XF 33mmF1.0? Is it just a spectacular lens on paper (“world’s first mirrorless lens with F1.0 maximum aperture and AF capability“) that will raise lots of curiosity and chatter, but stay mostly unsold in warehouses? I don’t think so, but of course only time will tell. What we can do, though, is to discuss why you would buy the XF33mmF1.0 and which use it would have for your kind of photography. Why should we start saving for it? Let us know in the comments down below. And of course, down below is a little and simple poll: are you interested to buy the new roadmap lenses? I know it depends on performance, price and many other (also personal and professional) aspects, but I’d just like to know if you have a general interest to eventually buy one of these lenses (or you are absolutely not interested in them). Back on the 2nd of February 2017, I was contacted by source, who told me that Fujifilm was right now collecting ideas and taking decisions on what should be the next lenses on the roadmap. The source told me that this is the perfect (and only) moment, where we can eventually influence Fujifilm Japan’s future XF lens decisions. I hurried, and a few hours after the sources’ message, I already asked you guys which XF lenses you would like to get next (without unveiling to you about what the source told me, because I had no permission to… but the source gave me clear and expressed permission now to share this curiosity with all of you). Your response was instant and astonishing, and you guys shared several thousands of suggestions. And knowing that Fujifilm was about to take decisions, I worked non stop day and night for a few days, in order to sum up all your suggestions into 30 lenses, and be fast enough to ask you what you would like to get, before Fujifilm already took any decision. Well, 15,000+ of you voted the poll, and the rest is history :).